In January, Joyce and I returned together to Africa for the first time since leaving in December 2011. 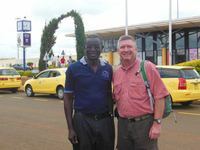 During our three week trip, we visited three African countries and fifteen HeartCry missionaries. 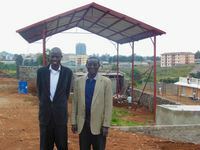 After an overnight in Nairobi, our first stop was Eldoret, Kenya to visit Naphtally and Helida Ogallo and Grace Baptist Church. Eldoret sits in the Rift Valley region at over 6000 feet in elevation, and coming from the middle of winter in Virginia, Joyce and I were very grateful for the mild climate. Eldoret has a population of over 300,000 and is currently the fastest growing city in Kenya. As rain clouds thickened on Saturday afternoon, Naphtally showed us their church building site. They have chosen a strategic location in a newly expanding residential area near the city center. 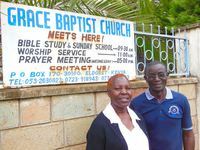 Eldoret saw some of the worst post-election violence in 2007, but in God’s providence, that violence produced a relationship that would one day bless Grace Baptist Church. During the violence, Naphtally and Helida’s home became a refuge for over 20 people from some of the most dangerous neighborhoods. 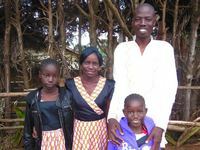 Paul Keno and his wife were among those that found safety in the Ogallo home. 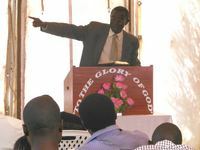 Paul was a zealous Charismatic pastor planting a church in Eldoret. He was touched by the Ogallo’s kindness and hospitality. Over the years, his friendship with Naphtally grew and his theology changed. Paul now serves as a co-elder with Naphtally, and it was a joy to hear him lead the adult Bible study on Sunday morning. 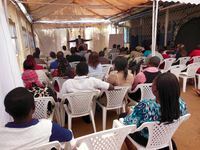 The meeting tent attached to the Ogallo home was full as about 70 people gathered for worship on Sunday morning. Brother Naphtally is a gifted preacher and it was a pleasure to sit under his ministry of the Word. 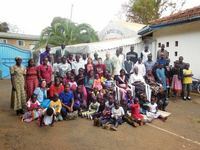 After Sunday worship, everyone gathered for a group photo, then we rushed off for the almost 4 hour drive (normally 2 ½ hours) to Kisumu in a torrential downpour.